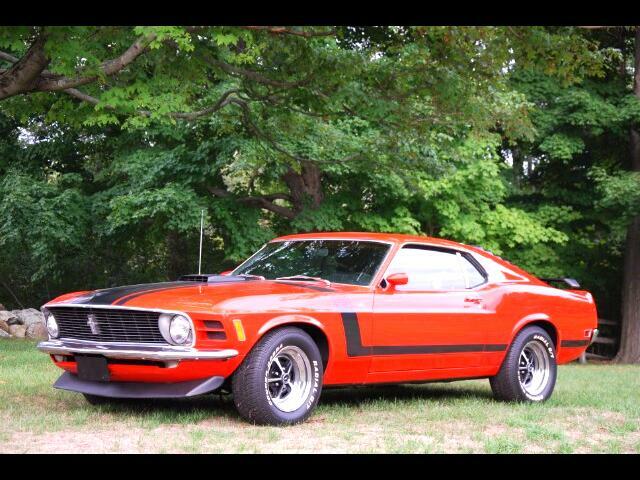 "Here is a Stunning 1970 Ford BOSS 302. This Calypso Coral over Black Rhino/Corinthian Bucket Seats example is equipped with an Original BOSS 302-4V Engine from another 1970 BOSS 302 (also documented in the registry) and is mated to a Close Ratio 4-Speed Manual Transmission linked to a 3.91 Traction-Lock Axle Ratio . This BOSS Features Power Front Disc Brakes, Hurst Shift Linkage, High-Back Bucket Seats, Instrument Gauges, BOSS Sport Striping . Additional Options (some original) include Shaker Hood Scoop, Sport Slats, Rear Deck Spoiler, and Tachometer with Trip Odometer. A former owner was the Publisher for "Fabulous Mustangs and Exotic Fords" Magazine which had this Boss 302 grace the pages on multiple occasions. This BOSS 302 is extensively Documented with service records and original Bill of Sale, Original FOMOCO Invoice, a Elite Marti Report. An Outstanding Ford Collectible for any enthusiast."